Byron Bay local, model and mum Ruby Tuesday Matthews has gained a global following for her honest opinions and depictions of stories from her family’s many adventures. Her two greatest achievements to date include the birth of her two beautiful boys, Rocket and Mars. Her candid snaps and hilarious Instagram stories allow a true insight into her world, along with her real and relatable voice. As a mum of two and a Byron local, we asked Ruby to share with us her family’s secret weapons comes to fighting colds. Time with my little ones is precious and fleeting. With Rocket in day-care, colds are a common cause of sickness. Those pesky colds hit us all over winter, causing sleepless nights and lots of tears, not to mention snotty noses! To beat this, I’ve put together a failsafe, cold-fighting kit with all the essential natural products my young family needs to ensure colds don’t take away our quality family time this winter. My number one medical kit go-to is the mundicare® Cold Defence Nasal Spray for both adults and kiddies to be taken at the first sign of a cold. The kiddies product comes in a gentler and softer mist making it an easy, fast application which is great as we all know how hard giving any medication to a toddler is. 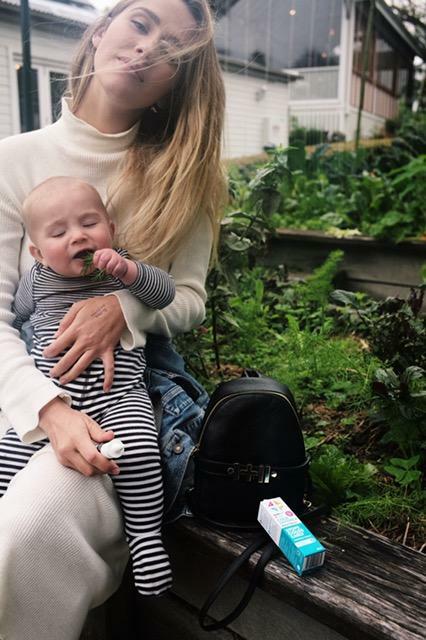 Most cold medicines actually only treat symptoms rather than the virus itself, but used at the first signs of a cold this nasal spray goes straight to the root and stops colds up to two days early*, 1-3 – a winner for families like mine who tend pass the bug around. If you’ll let me get technical for a sec, within 3-5 days it helps prevent colds by forming a protective barrier in the nasal lining to trap common cold viruses and reduces the severity of common cold symptoms. Plus, it’s natural and free from nasties like steroids and preservatives. Due to the fact that it’s made of natural products, pregnant mums or those breastfeeding are able to use it too. It’s one of my favourite discoveries! I also love a good probiotic. I find this helps keep my family’s gut health on track and ensures a healthy immune system. I always have these on hand when I’m feeling a little depleted. Ginger, orange and turmeric juices every morning are a must! Super easy to make and store in the fridge. Turmeric has antiviral properties that make it a smart choice for flu treatment and prevention. Like turmeric, ginger is also a powerful anti-inflammatory and a blast of Vitamin C is always good for any common cold. Another trick for an everyday household item is having a diffuser burning with your choice of scented oils. It keeps the house smelling nice and it also keeps the bugs away. I like to experiment and mix a few of my fave scents to find the most comforting combination. Finally, kids pass so many germs around at daycare so I’m big on antibacterial wipes and sprays when it comes to dirty hands and toys. I always have these bad boys handy around the house and in my bag when I’m on the go, to help avoid spreading those nasty germs in the early stages. Now tell me, what’s in your home cold-fighting kit? *When used at the first signs of a cold.